Get 24-hour frizz control with the Head & Shoulders Smooth & Silky Shampoo. Richly indulgent shampoo ideal for dry, damaged or frizzy hair. Head & Shoulders Smooth & Silky Dandruff Shampoo is formulated with added moisturizers to cleanse and restore dry, frizzy hair and leave it up to 100% dandruff free. Go ahead, run your hands through your hair again. Additional Information: Head and Shoulders, under the umbrella of P&G, is the most popular and trusted dandruff shampoo care brand. 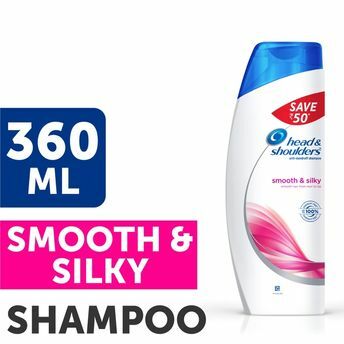 With unique innovation and breakthrough technology, Head and Shoulders has been offering effective hair shampoos, conditioners that have a reputation of keeping people dandruff free globally.